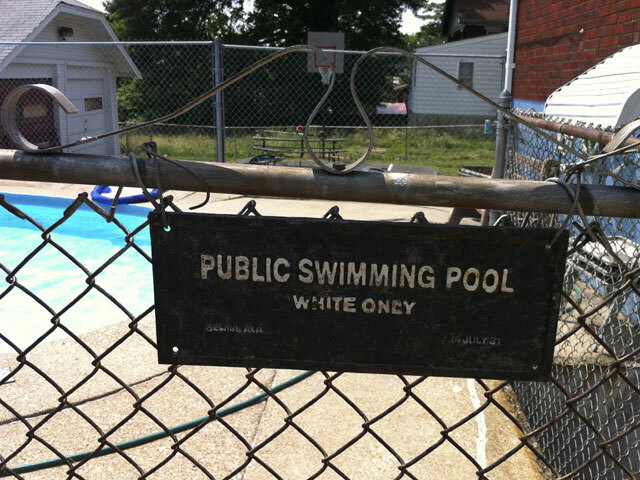 COLUMBUS, Ohio - A Cincinnati landlord who claimed a black girl's hair products clouded an apartment complex's swimming pool discriminated against the child by posting a poolside "White Only" sign, an Ohio civil rights panel said Thursday in upholding a previous finding. The Ohio Civil Rights Commission voted 4-0 against reconsidering its finding from last fall. There was no discussion. The group found on Sept. 29 that Jamie Hein, who is white, violated the Ohio Civil Rights Act by posting the sign at a pool at the duplex where the teenage girl was visiting her parents. The parents filed a discrimination charge with the commission and moved out of the duplex in the racially diverse city to "avoid subjecting their family to further humiliating treatment," the commission said in a release announcing its finding. An investigation revealed that Hein in May posted on the gated entrance to the pool an iron sign that stated "Public Swimming Pool, White Only," the commission statement said. Several witnesses confirmed that the sign was posted, and the landlord indicated that she posted it because the girl used chemicals in her hair that would make the pool "cloudy," according to the commission. She also added to ABCNews.com that the sign was an antique and merely a decoration. Even though the sign indicates that the pool is public, Hein said the pool is on her private property, and people have to ask her for permission to use it. The girl's father, Michael Gunn, in brief comments Thursday, described his shock last spring when venturing out for a lunch break by the pool. "My initial reaction to seeing the sign was of shock, disgust and outrage," Gunn said. He also told the commission that his daughter was saddened months later to learn the reason they moved from the apartment complex "was in a way related to the color of her skin." Gunn declined to speak with reporters. Hein's attorney, who informed the commission by email Wednesday that Hein would not attend the hearing, did not return phone and email messages Wednesday and Thursday from The Associated Press. A recording on Thursday said Hein's voicemail was full and could not accept messages. "I was trying to protect my assets," she told the commission's housing enforcement director in a Sept. 27 interview. Racial discrimination has particular resonance in Cincinnati, whose population is 45 percent black, far higher than the rest of Ohio, which is about 12 percent black. Surrounding Hamilton County is 26 percent black. Cincinnati was the scene of race riots in April 2001 when police and demonstrators clashed in a blighted neighborhood following the shooting of a black suspect by police. The commission's statement said that its investigation concluded that the posting of such a sign "restricts the social interaction between Caucasians and African-Americans and reinforces discriminatory actions aimed at oppressing people of color." It still would be possible for the parties to reach a settlement overseen by the commission before any legal action is taken. If those discussions don't bear fruit, the commission would issue a formal complaint and refer the matter to the Ohio attorney general's office, which would represent the commission's findings before an administrative law judge. That judge would determine any penalties, which could include a cease-and-desist order and punitive damages. Any decision by the administrative judge could be appealed to Hamilton County Common Pleas Court in Cincinnati.